ISLAMABAD, Pakistan (CNN) -- Pakistani authorities increased security throughout the capital Friday after this week's deadly bombings in Lahore and Peshawar and a threat by the Taliban to carry out further attacks. 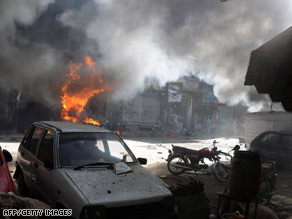 Smoke billows from a fire at the site of a marketplace bomb in Peshawar, Pakistan, on Thursday. All vehicles must go through checkpoints before entering Islamabad, the city's deputy police inspector general Bin Yamin told CNN. Three people have been arrested in Islamabad in connection with the current threats, he said. The Pakistani Taliban claimed responsibility for Wednesday's suicide attack that killed 27 people in Lahore. It also threatened to continue attacking cities in Pakistan until the military ends its operations against Taliban militants in the country's northwest. There has been no claim of responsibility for the Thursday attacks in North West Frontier Province. Officials said they believed bombers who killed 12 victims Thursday may have caused some of the blasts to lure people nearer before detonating further explosions. The attacks targeted Dera Ismail Khan and the provincial capital, Peshawar, where government forces have waged a massive operation against Taliban militants. The deadliest of the attacks occurred early Thursday evening. Timed explosive devices on two parked motorcycles detonated back-to-back, killing six people at two crowded adjacent bazaars, said Shafqat Malik, Peshawar bomb disposal squad chief. Two children were among the dead, and at least 75 people were wounded. Three suspected militants were killed by police. After the bazaar attacks, several of the suspects fled to a rooftop, where they fought a gunbattle against police. Three suspected militants were killed, police said. The militants are going after both civilians and military targets, and some analysts believe Pakistan should prepare for more attacks as its military operation continues against the Taliban. "This will increase to an extent because they (the militants) are on the run, and when they are on the run they have to do something somewhere," military analyst Gen. Jamshed Ayaz Khan said. The Pakistani military reported Friday that its forces killed 28 "terrorists" in the Swat region and apprehended seven others -- including several commanders -- in the past 24 hours. Four Pakistani soldiers died in a roadside bombing attack on Thursday near Mingora, the largest city in the Swat region, the military said. The fighting has uprooted some 2.4 million Pakistanis from their homes in the northwestern region of the country, according to the latest data from the United Nations. Peshawar police recovered two suicide vests and said they thought the attackers might have caused initial blasts to lure more people to the area before detonating additional explosives. Thick smoke engulfed the streets after the attacks, and GEO-TV showed dazed people mingling and running amid burned-out vehicles and mounds of building debris. Firefighters doused flames, and other emergency workers scrambled to rescue people from rubble. In another bombing Thursday, three policeman and one civilian were killed on the outskirts of Peshawar, authorities said. Another suicide bombing occurred later in Dera Ismail Khan, the province's southernmost city. A police officer and a civilian were killed, authorities said. At least 12 were wounded. Peshawar and Dera Ismail Khan are more than 250 kilometers (155 miles) apart.